Another Christmas Tea Favorite is Devonshire Cream. Serve it with scones, lemon curd, and Jam. Devonshire Cream – Robbin P.
Cream the cream cheese in a cool bowl until soft. Add and whip the cream, sugar and salt alternately until firm peaks form. Will keep in a very cold fridge overnight. You will have to re-whip if you keep it for more than 24 hours because it does separate. Will keep for 3-5 days though. Categories: Christmas Tea | Permalink. In a large bowl, mix dry ingredients together. Cut butter into dry ingredients with pastry cutter, until they resemble fine crumbles. 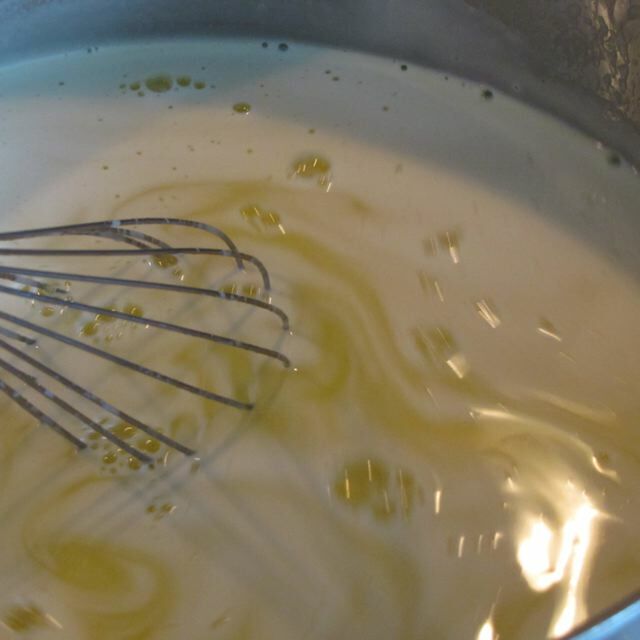 Whisk eggs and whipping cream together. Make a well in the dry ingredients, and pour in the wet ingredients and cranberries. Stir gently with fork until dough holds together. With hands, bring dough together into a ball. Pour out onto a floured surface and knead gently for about 10-15 times. You want to handle the dough as little as possible or the scones will become tough. Place scones on a lightly sprayed cookie sheet (of if you are using silicone baking mats, you can skip spraying the pan) leaving about 3/4:-1″ between each scone. Bake at 400 F for 12-14 minutes, or until golden brown. Cool on racks. Serve warm with Lemon Curd. FREEZE: Or store airtight and freeze for up to one month. If frozen, place from freezer into heavy duty foil pans and bake at 300 for about 15 minutes. Or defrost in open air to keep from getting moist and bake for 5 minutes at 325. If you have parchment paper or even better silicone baking sheets (silpat is a great brand that I highly recommend, but they are pricey.) to place on your cookie sheets, it will prevent the bottom of the scone from browning too quickly during baking, plus they will be easier to remove from the pan. Sugar in the Raw is easy to find and a great finishing sugar – I found them in a convenient packet size and two packets will be enough sugar to top 8 large scones. Before brushing the scones with egg white wash, separate them into individual wedges so the sides also get the egg wash and sugar. If you have one of the plastic sheets that has circles of different size printed on it, you will find it an easy task to form a circle, and your scones will be more uniform. Categories: Baking - Bread, Christmas Tea | Tags: Christmas Tea, Christmas Tea Recipe, Cranberry Scone Recipe, Cranberry Scones, Scone Recipe | Permalink. Where have I been? life has interrupted me several times in the past weeks and has made it difficult to blog – Plus, my husband and I are trying to lose weight and it’s been hard to make “naughty stuff” if you can’t eat it all! As I mentioned before, I am on the food committee for our church’s Christmas Tea – Scones, served with Lemon Curd, Devonshire Cream the works! Thankfully I am not alone in the endeavor and help has been easy to find! So happy! I volunteered to make the lemon curd for the tea, as I already had experience making it with my wonderful friend Robbin, who headed up the Christmas Tea Food Prep for years – but alas all good things must come to and end and my friend is moving to Washington State. Her touch will be dearly missed! 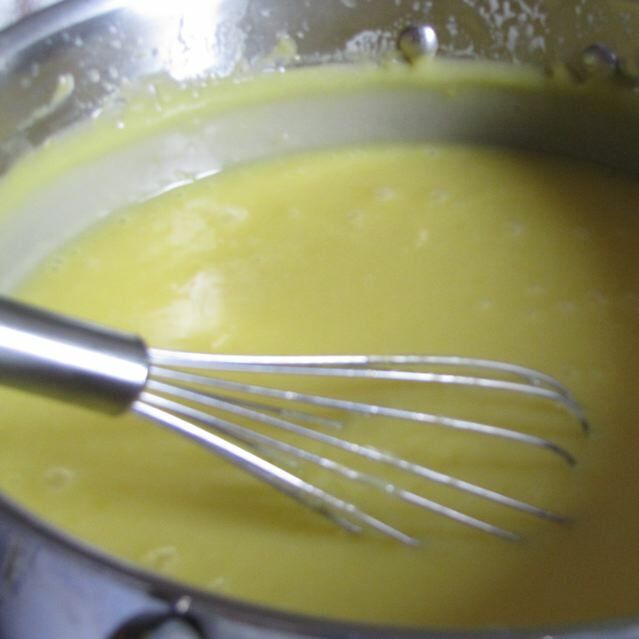 Lemon Curd is actually not hard to make, just expect that your arm is going to fall off stirring. I made one big batch today and have 8 more batches to follow. A large batch will yield 9 cups of lemon curd. That serves 72 (2 Tbsp size) servings. The end goal: Lemon Curd for 600! 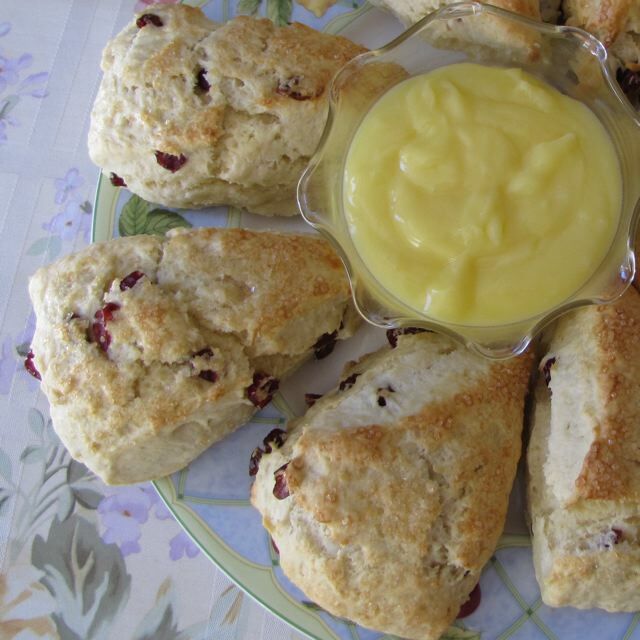 Lemon Curd is served with warm scones (Cranberry Scones – recipe coming soon). Living in Southern California has it’s benefits. One of them is fresh lemons. My friend KC has a wonderful lemon tree in her yard and last summer she invited me to pick lemons. Her lemons were large- some of them almost the size of grapefruit. 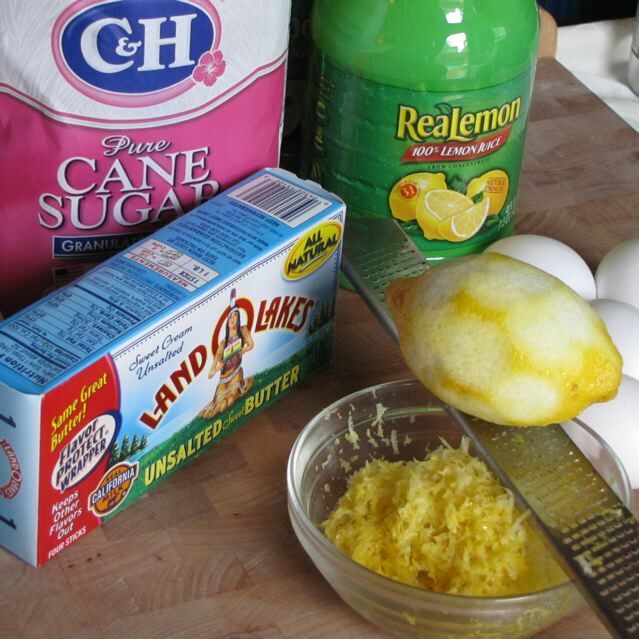 I did research that you can freeze fresh lemon juice and lemon zest – so that is what I did. Thank you KC for your generous contribution. 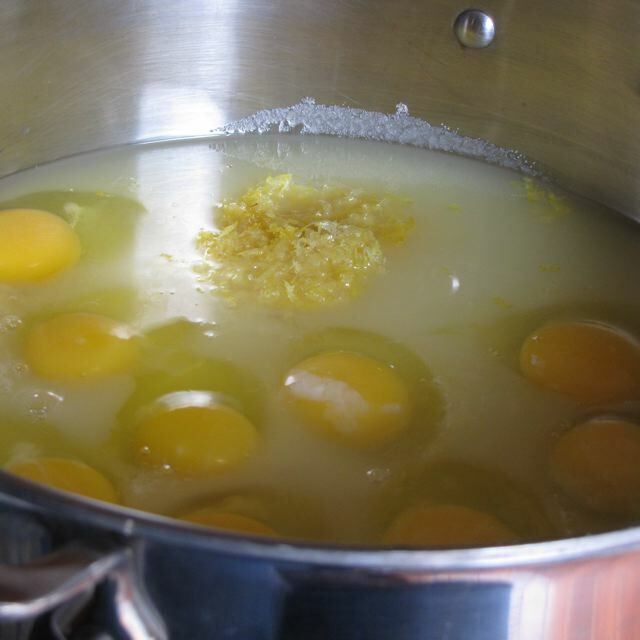 Place the eggs, sugar, lemon zest, and lemon juice in a sauce pan. (To zest, invest in a good micro-plane it makes the grating of the lemon easy – zest by the way is grated lemon peel, so wash your lemons first). 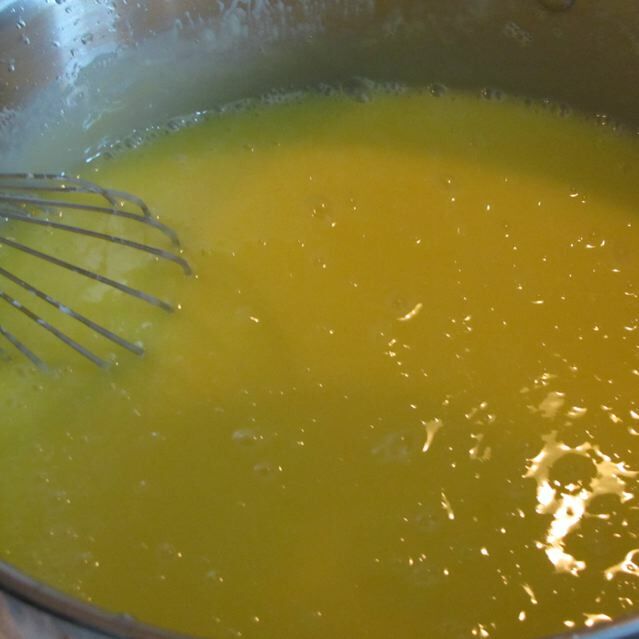 Use an immersion blender to combine the egg, sugar, lemon mixture (Immersion blenders cost around 30-50 dollars and are a great investment for a kitchen). The mixture will be foamy. Place the pot over medium heat, stirring constantly with a whisk in a circle eight fashion. 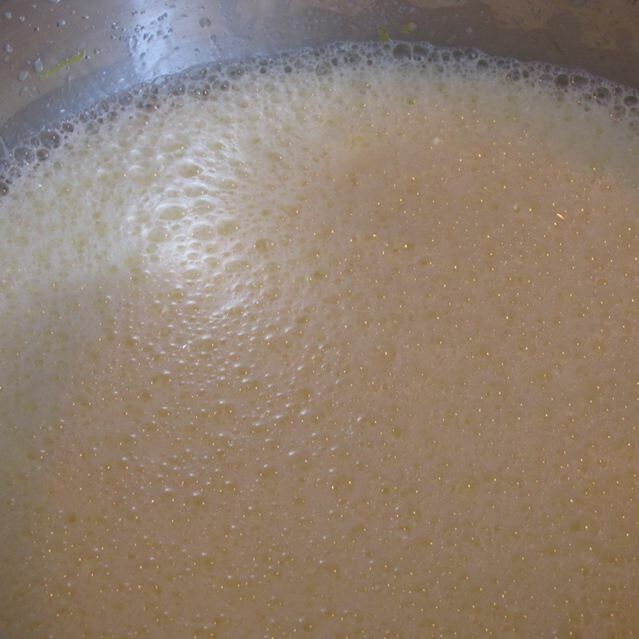 The bubbles will slowly subside and the mixture will thicken. 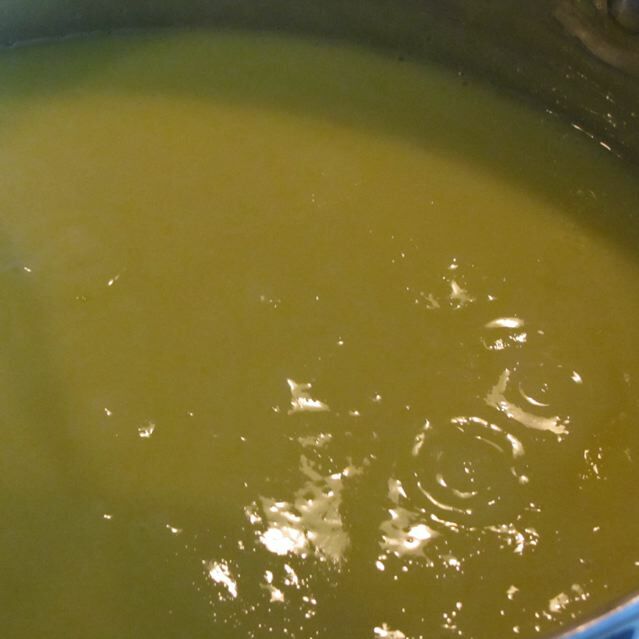 Continue stirring until it comes to a good boil. Turn your burner off and remove the curd from the heat. 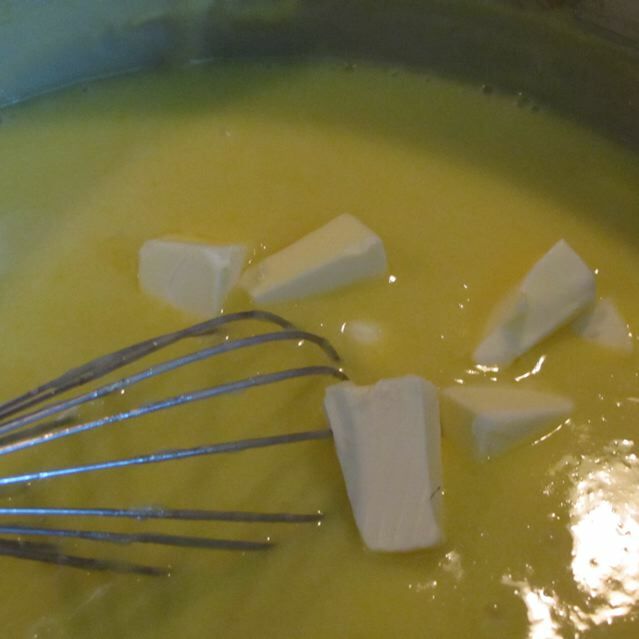 Cut the softened butter into smaller chunks and add a few at a time and mix them into the lemon curd with a whisk until the butter is completely dissolved. Finish with remaining butter. Whisk to combine. Pour the lemon curd into a plastic container and allow to cool completely before covering with a lid and cooling in the refrigerator. NOTES: Lemon Curd will keep for 1 week in the refrigerator or can be frozen for up to 3 months. Categories: Christmas Tea, Lemon Curd | Tags: Christmas Tea, Lemon Curd | Permalink. Okay okay, I know you have been sitting on pins and needles have you not? Probably not, but in case you want to know. “Becky, what is the salad for the tea going to be?” Well, it is neither of the previous posts… HAHA right? Well, not entirely! What we will do is make the Blue Cheese Pear Salad and add the thin strips of red or yellow peppers and also use the dressing from the Claim Jumper Salad. I hope it is a happy union! I have salad coming out my ears now, because I have all these leftovers, but I’m not complaining. It truly is okay! In case you are interested what the third salad was that we tested it is Trisha’s Festive Tossed Salad. The dressing is very potent though, so we decided not to go with it. Dressing: Whisk dressing ingredients well and refrigerate to allow the flavors to develop. Before serving, whisk well to combine again. Serve 2 Tbsp of dressing with each serving of salad. Candied Pecans: Heat a skillet over medium heat, stir 1/4 cup of sugar together with the pecans. Continue stirring gently until sugar has melted and caramelized the pecans. Transfer the nuts onto waxed paper. Allow to cool, and break into pieces. For the salad: In a large serving bowl, layer lettuce, pears, blue cheese, avocado, bell pepper strips,and green onions. Pour the dressing over salad, sprinkle with candied pecans, and serve. Categories: Christmas Tea, Main Dish - Salad, Side Dish - Salad | Permalink.